How would you define cancer? I think that one of the problems with our perception of cancer is that we have one word for it – ‘Cancer’. We think it is one disease. In fact, it is a group of around 200 different diseases with their own sub-types. Because we think it is just one disease, people cannot understand why we do not have one ‘cure’ for it. In reality, we will need over 200 different types of treatment leading to possible cure. Cancer is a term which comes with baggage, and I think this is a generational thing. People diagnosed with cancer 50 years ago had very few treatments options available to them. Surgery was OK but not brilliant, radiotherapy was very basic compared to what we have now, chemotherapy was pretty much seen as a ‘last chance saloon’ when everything else had failed. There was very little understanding of what cancer was as a disease. Consequently, cancer struck the ‘fear of death’ into people. People did not discuss it and if they did so, they talked in a quiet voice. Nowadays cancer is more openly discussed, it is in the media and the younger audience are more knowledgeable about this disease than ever before. Open discussion and understanding are leading to earlier diagnosis which will save many lives and our scientific knowledge of cancer is increasing, leading to more novel targeted approaches to cancer treatment. But still that fear exists. 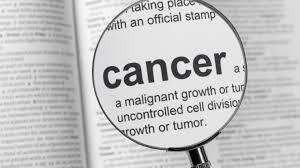 Some people view cancer as some evil entity which is invading the body, but in reality, these are your cells which have gone rogue, mutated and changed from years and years of damage, be that random errors in DNA replication, damage from the environment or damage caused by things that we do to ourselves’; smoking, drinking, sunbathing and so on. Such cells seem to wage silent warfare on the body, which is relentless, even in the face of some of our treatments, engaging in stealth tactics to evade our immune system and move ‘unseen’ throughout the body to areas which house critical structures necessary for homeostasis of the human body. A diagnosis of cancer is without doubt a frightening experience. It is life-changing in ways that unless you have been diagnosed, or had someone close who has been diagnosed, it is difficult to comprehend. Insurance, travel, mortgages, work, driving, walking, shopping, socialising and many more aspects can become daunting and difficult. The management of a person with cancer is not just about the treatment. The support mechanisms that a person with cancer has, plays a huge role in how they cope with the hard road ahead. And for some this life-changing experience is grasped with both hands. All of a sudden life is seen as something that needs to be taken full advantage of. These people feel empowered, freed almost to do the things that they have put off; run marathons, bike for hundreds of miles, climb mountains, learn to swim, do stand-up comedy. Not everyone will feel like this, and it’s not obligatory. It can be heart-breaking when someone close to you is diagnosed, and even more so if they die of this disease and, unfortunately, some will. But there is hope. Our understanding of cancer is becoming clearer and is leading to some fantastic treatments. And whilst we are not successful across the board there are some cancers that are very curable. Most women survive cervical cancer, certainly compared to pre-screening age. The cervical screening programme has revolutionised how we deal with cervical cancer, changing it from a disease where many women died to one where few women die (which is why it is important to attend for cervical screening). The HPV vaccination programme is already significantly reducing the numbers of women with cervical cancer and it is hoped that this will also have an impact on reducing other types of cancer associated with HPV exposure. The chemotherapy we use for Hodgkin Lymphoma is brilliant, harsh, but brilliant. Again, Hodgkin lymphoma is a disease with excellent survival prospects. Acute Lymphoblastic Leukaemia, which mainly affects children is a very curable disease in most. 80-90% of women with breast cancer will survive more than 5 years. There are lots and lots of success stories. Yes, we still struggle with lung cancer, pancreatic cancer, certain leukaemias and others, and work will continue with these to break the cycle. In 2014 the World Health Organisation warned about a cancer epidemic. The numbers coming through our door with cancer continue to increase in all corners of the world. But there is hope. Our understanding of risk factors associated with cancer has led to very successful campaigns to educate people about what they can do to reduce their risk. As a result of campaigns like SunSmart in Australia, and those in the UK, it is expected that rates of malignant melanoma will start to fall in 15 or so years’ time. Stop smoking campaigns have seen a reduction in the numbers smoking across the UK and other countries. Certainly, in men the UK there has been a significant drop in the numbers of lung cancers as the numbers of male smokers reduce. Many heath campaigns highlight the relationship with diet and certain cancers have led to people eating healthier with less processed meats and a higher fibre content. It is hoped that such habits will reduce the numbers of people with bowel cancer in the future. Remember, cancer is a progressive disease. It takes years to develop. Tiny bits of damage here, tiny bits of damage there, over many years. Work will continue in finding better treatments, but, at the moment, educating our young people about the risk factors, and promoting a healthy living style is probably the best way we have of reducing the impact of cancer. I hope you have enjoyed this post. Please share with others who might also benefit from this material. 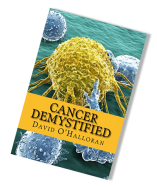 Don’t forget that you can learn more about cancer and much more at my courses and webinars.